(rfd.gov.vn)- The number of IoT connected devices is expected to increase rapidly in the future, even more than the number of public mobile subscribers. The problem with the frequency management agency is that it selects the appropriate frequency band and transmit power level for the IoT radio equipment, ensuring that it does not interfere to radio systems are being licensed. This is also one of the research topics receiving special attention at the APT/AWG regional conferences and Research Team No. 1 of the International Telecommunication Union ITU-R.
IoT connectivity plays an important role in promoting the development of telecommunications technology and services in the digital economy. In that context, to meet the connection requirements for tens of billions of IoT-connected devices will require the support of different types of radio technology, using different frequency bands. One of the bandwidth solutions is the use of radio frequency bands exempted from the use of radio frequencies for short range radios such as 434 MHz, 2.4 GHz. In Vietnam, the list of frequency bands exempted from the license for use of frequencies and conditions of use is stipulated in Circular No. 46/2016/TT-BTTTT dated 26/12/2016. In recent times, the Radio Frequency Department has received suggestions from a number of local companies and manufacturers and suppliers of foreign IoT-connected radio equipment for allowing the use of the 920 MHz band for wide area IoT connection with power over 25 mW ERP to over 306 mW ERP (equivalent to 500 mW EIRP). 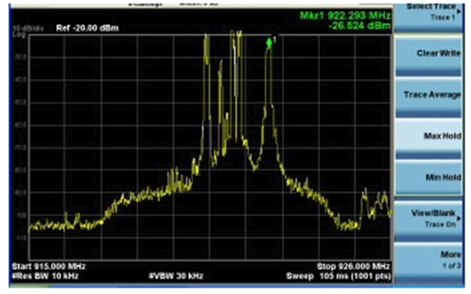 This frequency band is within the separation between the transmit band and the receiving band of the GSM/IMT 900 MHz mobile communication system (Figure 1). 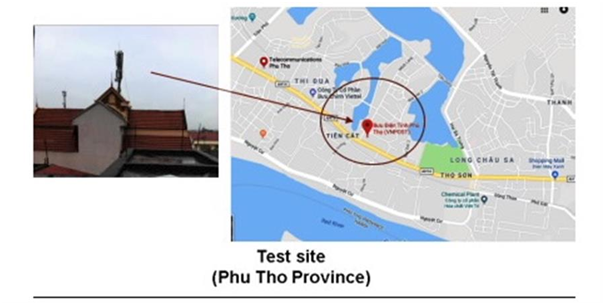 At the end of August, in Viet Tri city, PhuTho province, the Radio Frequency Department together with experts from Mobifone, Vietnammobile and experts of manufacturers and suppliers of IoT wireless communication equipment has been deployed the measurement of harmful interference from IoT radio equipment using the 920 MHz band to the public land mobile communication system. IoT low power radio connection technology (LPWAN: Low Power Wide Area Network) was developed to support low-speed data transmission scenarios with wide area coverage using smart sensors in smart home, intelligent industry, ... Figure 2 below shows the reference structure diagram of a low-power IoT connection system. Based on the above international management and trend, the objective of the Radio Frequency Assessment Tester is to review the technical conditions of radio frequency, power, and appropriate noise reduction techniques for use in Vietnam. During the measurement of disturbance in Viet Tri city, the IoT radio system is required to establish the technical parameters (operating frequency, transmit power, antenna height) according to the interference scenarios generated by the Department of Radio Frequency. Table 1 below details the specifications that have been established in the noise assessment. The emission spectrum from the IoT-connected equipment using the 920 MHz band is measured and described in Figure 3 below. Interference scenarios were constructed with the requirement of adherence to the initial objective of assessing the harmful interference effects of IoT-connected radio systems using the band in the band-gap separator 900 MHz to the GSM/IMT public mobile communication system (Figure 1). Accordingly, the first scenario is designed to assess the impact on the revenue of the 900 MHz (UE) GSM mobile; while the second scenario was to evaluate the interference effect to the 900 MHz GSM base station. In each noise evaluation scenario, the technical parameters (operating frequency, maximum output power) of the IoT device and the relative position between the two systems are adjusted to select the appropriate set of parameters, ensuring no harmful interference to the mobile communication system. Figures 4 and 5 below describe two interference scenarios; Figure 6 depicts the location of the 900 MHz GSM base station selected for monitoring network quality when the presence of low-power IOT emissions across the 920 MHz band occurs. Interference measurement and evaluation results are one of the important practical basis to support the development of the draft circular amending and supplementing the list of radio equipment exempted from the radio frequency use permit, technical conditions and exploitation. It is expected that this document will be submitted by the Department of Radio Frequencies to the MIC in 2018. The study adds the 920 MHz band to low-power radio equipment with appropriate technical conditions, along with the frequency bands specified in Circular No. 46/2016/TT-BTTTT will contribute to the development and development of equipment ecosystems and applications of IoT connectivity in Vietnam in the coming time. Contact us when you have any concerns or questions.